European Recognition of first aid certificates – SAM.I. publishes recommendation paper | SAMARITAN INTERNATIONAL e.V. Today, a first aid course attended in one EU member state is not necessarily recognised in other member states. This is because official standards for cross-border recognition do not exist yet within the EU. „EU standards are a prerequisite for mutual recognition of certificates”, said Knut Fleckenstein MEP and President of SAMARITAN INTERNATIONAL (SAM.I.) on Wednesday in Brussels. Mr. Fleckenstein and SAM.I. Secretary General Ivo Bonamico officially handed over the SAM.I. recommendation paper „Single European First Aid” to Martin Schulz, President of the European Parliament. In this paper, the SAM.I. EC First Aid recommends to officially define learning results for first aid education, as is done in many other fields of education recognised via the European Qualification Framework (EQF), to facilitate cross-border recognition of certificates. „First aid is not taught in exactly the same way everywhere in Europe. We see no need to change this. Instead, we want to define the certified courses by learning results. It’s the only way we can enable the comparability of certificates in Europe.”, explained Knut Fleckenstein. A recognition of certificates across the EU would be an important incentive for people to learn and render first aid. 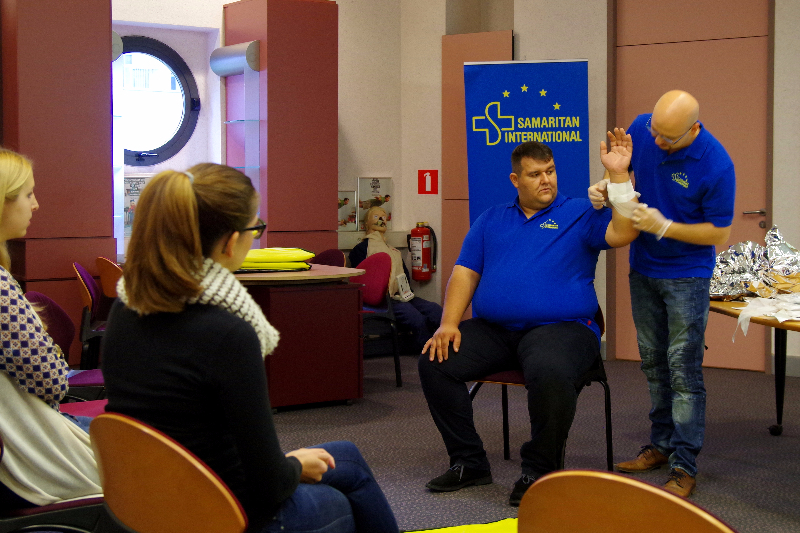 An international team of trainers offered first aid courses for MEPs and their staff. The official definition of learning results in first aid training should, on the recommendation of the EC First Aid, be conducted by the European Agency for Health and Safety at Work (EU-OSHA), based on the guidelines of the European Resuscitation Council (ERC). 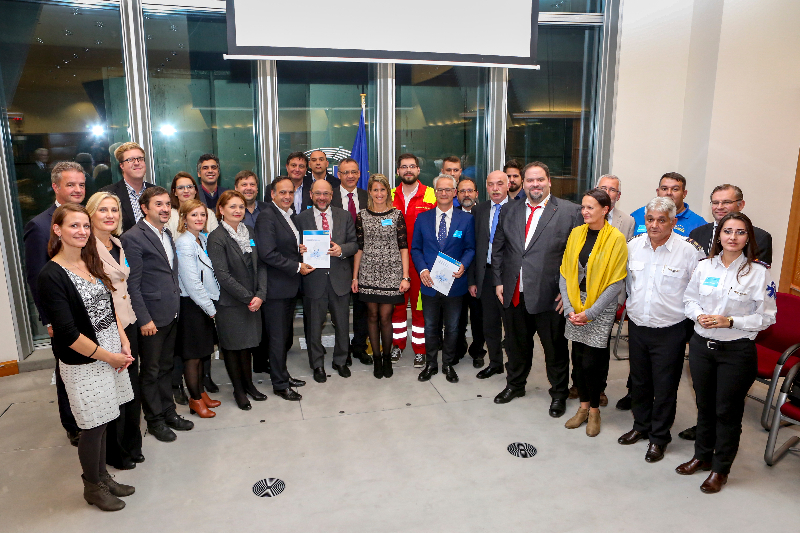 To make Members of the European Parliament and their staff aware of the importance of first aid, parliamentary offices of the relevant committees for the topic were invited to take part in first aid courses. The offer was met with overwhelmingly positive feedback. 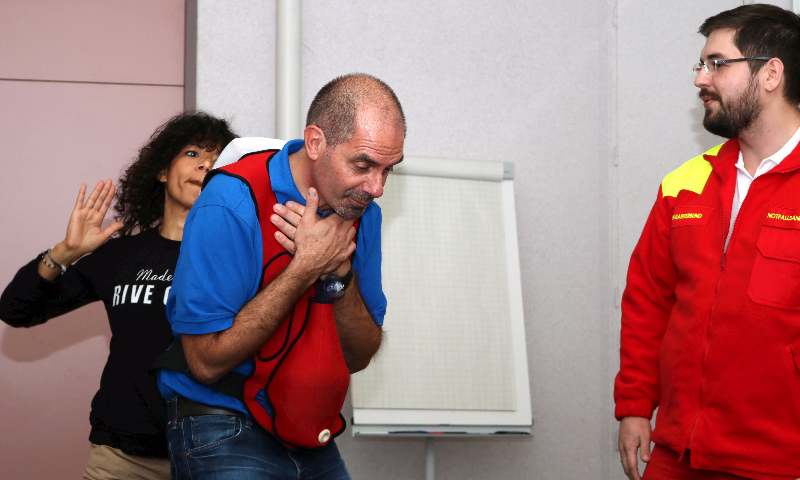 Samaritan first aid trainers from Austria, Germany, Italy and Romania taught courses for about 30 MEPs and staffers.